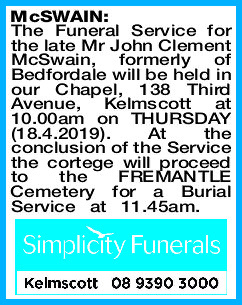 The Funeral Service for the late Mr John Clement McSwain, formerly of Bedfordale will be held in our Chapel, 138 Third Avenue, Kelmscott at 10.00am on THURSDAY (18.4.2019). At the conclusion of the Service the cortege will proceed to the FREMANTLE Cemetery for a Burial Service at 11.45am. 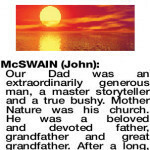 MCSWAIN JOHN Our Dad was an extraordinarily generous man, a master storyteller and a true bushy. Mother Nature was his church. 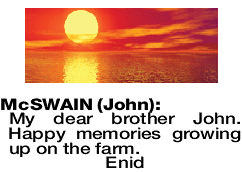 He was a beloved and devoted father, grandfather and great grandfather. After a long, full life he died peacefully on his 95th birthday with his daughters Cherie and Denise by his side. He will always be with us as we walk in nature, keep the campfires burning and pass his stories on. To remember and celebrate his life we will meet in Busselton on Tuesday 23rd April and at his Moore River block in early May. If you would like to join us contact Cherie 0417 090 619 or Denise 0478 604 668. Treasured memories Cherie, Karen (dec), Denise, John, Phil and families. 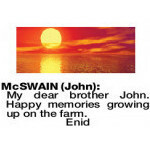 MCSWAIN JOHN My dear brother John. Happy memories growing up on the farm.